K-12 education is abuzz with interest in personalizing instruction and a drive to change the student experience. Yet amid this innovative fervor, the traditional classroom staffing arrangement is still an unquestioned assumption in many schools, with each teacher working largely alone, taking sole responsibility for a roster of students. By adding personalized learning to teachers’ workloads without changing how schools are organized, schools face a great risk that their attempts to personalize learning will fall short of their promise. Some pioneering schools with noteworthy student achievement results have begun to address this by personalizing their instruction through innovative staffing arrangements combined with blended learning. These approaches often provide teachers with team-based support and career paths, and give students more opportunities for small-group instruction, connections to adults, and instruction personalized to their needs. Over the past year, Public Impact and the Clayton Christensen Institute have partnered to study some of these schools, using site visits and interviews to investigate eight such district, charter, and private schools or school networks in New York, Nevada, North Carolina, Illinois, and California. A new report, released last week, documents the findings from this research, accompanied by school profiles and videos. These roles included teacher-leaders, collaborating teachers, support staff, and teachers-in-training. Teacher-leaders led small instructional teams. They often planned and directed instruction for other team teachers, coached teachers, and analyzed data. Collaborating teachers had roles similar to those of typical classroom teachers, but they worked in teams and supported one another more than usually happens in traditional settings. Support staff were noncredentialed educators who tutored or mentored students and led one-on-one or small-group instruction. Teachers-in-training supported teacher-leaders or collaborating teachers and taught while learning on the job. All these roles helped the schools personalize learning by providing more students with great teaching. What made the staffing arrangements at these schools unique was how they organized their various educator roles into small teams for co-teaching, team teaching, and intensive collaboration. For example, some schools had teams of three or more educators working together in a large, common learning space with shared responsibility for 60 students. In other schools, educator teams taught in separate learning spaces but shared responsibility for large groups of students that they organized daily or weekly into smaller groups based on student learning needs. Collaboration gave teams broader insights into individual student needs, helped develop their instructional skills faster, and helped improve accountability for student outcomes. In multiple interviews, teachers stressed that “these are our kids,” and most of the schools rejected the notion of every teacher owning his or her own classroom. The roles and teams at these schools not only allowed educators to better support their students but also provided increased opportunities for support, development, and career advancement. School teams had cultures of intensive coaching, with weekly or even daily observations and feedback. The varied roles also created opportunities for educators to take on increasing responsibilities as their expertise grew — often for increased pay, within regular school budgets — without having to leave the classroom. Many schools also created paid fellowships and residencies that enabled them to train their own teachers, thereby building their flow of future educators. Blended learning — the integration of online learning into brick-and-mortar schools — went hand in hand with innovative staffing models. The real-time student learning data produced by blended learning software gave educator teams a shared picture of students’ progress and needs. Software data also allowed schools to frequently regroup students, respond quickly to those who were struggling, and help teachers improve by pinpointing instructional planning and professional development issues. 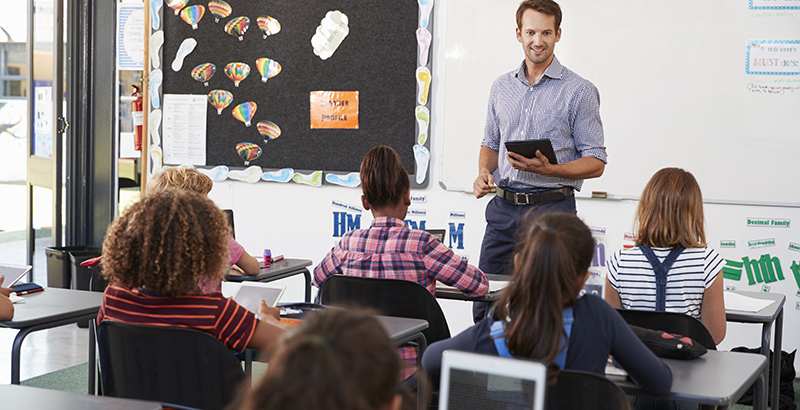 With the combination of blended learning and new staffing models, these schools are starting to unleash their most valuable asset for improving student outcomes: excellent teachers. The organizational inertia of traditional staffing arrangements may take some time to change. But as schools like these produce promising strong results and then refine and codify their practices, more schools across the country can have the will and the means to follow in their footsteps. Thomas Arnett is senior research fellow at the Clayton Christensen Institute. Bryan C. Hassel is co-president of Public Impact. Bryan C. Hassel is co-president of Public Impact.